I’ve joined the Daring Bakers when I first came back to Malaysia a couple of years back (in 2007), did a couple of challenges, then I stopped. All because I was a little too busy with work and even almost stopped blogging then. Then now, I decided that I’ll take on the challenge even if I’m busy, because that’s what the whole spirit is all about (Cause really, I’m not that busy now). OK maybe if I’m travelling, then I’d skip. I’ve also even joined Daring Cooks, yeah I think I’d be able to handle some pots and pans now, so bring it on! If you’re wondering what I’m talking about, The Daring Bakers, The Daring Kitchen were first founded by Ivonne and Lisa. 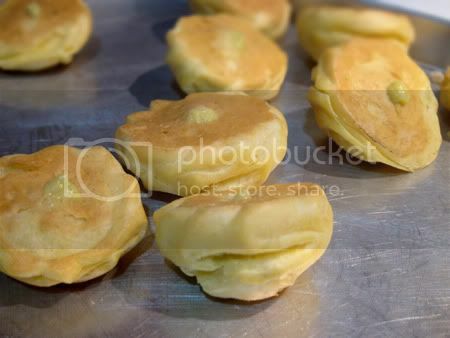 Basically in a nutshell, every month, we are challenged to make whatever it is that was hosted, it could be bread or cake or like this, choux pastry, and to follow and use the same recipe. And you’d be surprise on how different a cake can be even with the same recipe! My puffs were pretty soft, but a little flat. I made a mistake by piping them wider instead of taller. !! 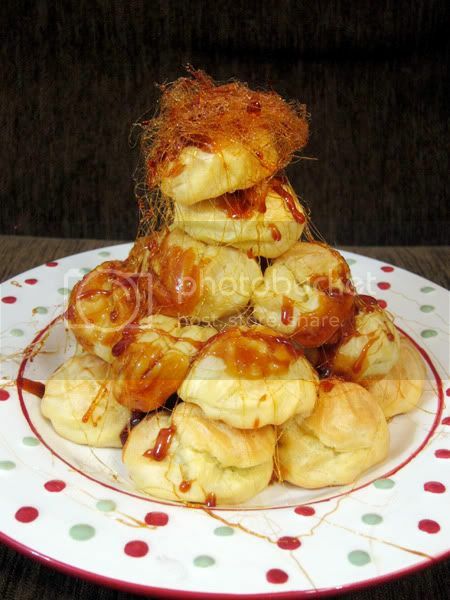 Anyways, the challenge was to make a piece montee, or I’d like to call it croquembouche. 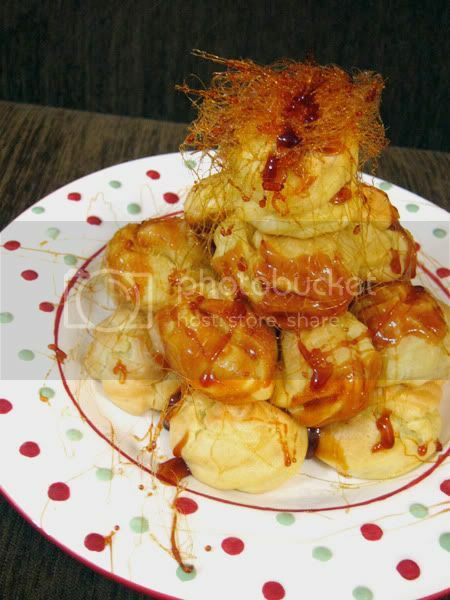 This is the 2nd croquembouche I’ve made so far with choux puffs. The first was in pastry school, where every possible puffs had to be the same size. 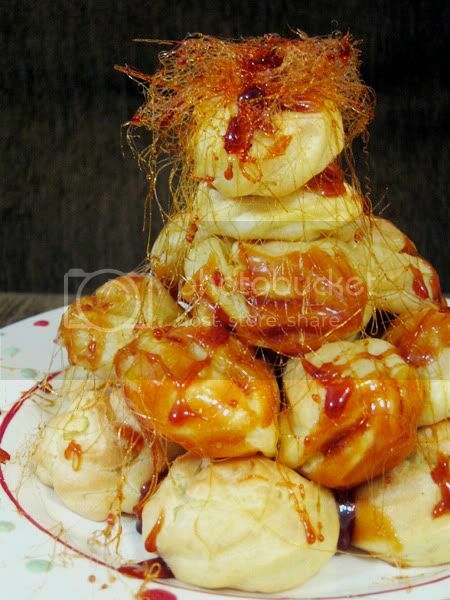 If you’re wondering, what on earth is croquembouche, it is a kind of pièce montée often served at weddings, baptisms, and first communions. It is a high cone of profiteroles (choux filled with pastry cream) sometimes dipped in chocolate bound with caramel, and usually decorated with threads of caramel, sugared almonds, chocolate, flowers, or ribbons. The name comes from the French words croque en bouche meaning ‘crunch (or munch) in (the) mouth’. You would have seen it in Masterchef Season 1, or in a Korean TV-series, My lovely Kim Sam Soon. It’s not all that popular here as the humidity melts the spun sugar in no time. Mine became sticky caramel sugar/ liquid in just 5 minutes. Can you believe it!!?? Pre-heat oven to 425?F/220?C degrees. Line two baking sheets with parchment paper. Transfer batter to a pastry bag fitted with a large open tip (I piped with Wilton’s tip 1M ). Pipe choux about 1 inch-part in the baking sheets. Choux should be about 1 inch high about 1 inch wide. Bake the choux at 425?F/220?C degrees until well-puffed and turning lightly golden in color, about 10 minutes. Lower the temperature to 350?F/180?C degrees and continue baking until well-colored and dry, about 20 minutes more. Remove to a rack and cool. 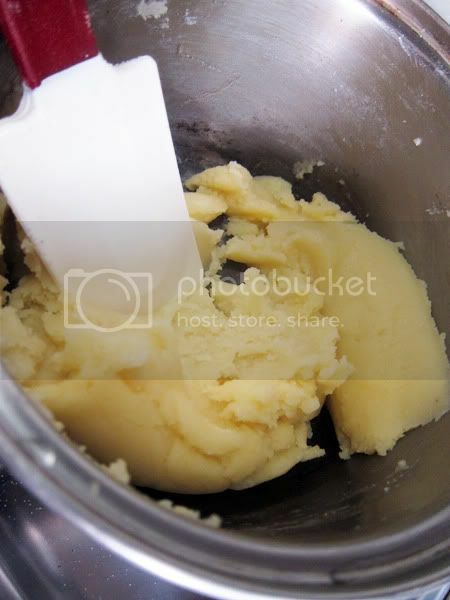 Combine sugar and lemon juice in a saucepan with a metal kitchen spoon stirring until the sugar resembles wet sand. Place on medium heat; heat without stirring until sugar starts to melt around the sides of the pan and the center begins to smoke. Begin to stir sugar. Continue heating, stirring occasionally until the sugar is a clear, amber color. Remove from heat immediately; place bottom of pan in ice water to stop the cooking. Use immediately. If the glaze hardens in the pot, you can lightly warm up and reuse it again. Dip the top of each choux in your glaze (careful it may be still hot! ), and start assembling on your cake board/plate/sheet. Continue dipping and adding choux in levels using the glaze to hold them together as you build up. When you have finished the design of your piece montée, you may drizzle with remaining glaze or use ribbons, sugar cookie cut-outs, almonds, flowers, etc. to decorate. I did a spun sugar by dipping a fork into the glaze and swift it left & right really quickly with my wrist (not the whole hand) on a flat lightly greased pan. Then gather the spun and make into a ball. Or you can do the same thing on top of the croquembouche. * Choux pastry should just be the consistency of thick mayo. Eggs from different country probably weigh differently and choux is quite sensitive to the amount of eggs you put it. I would say, start with 1 and gradually add in the next. If you think you’re not sure, lightly beat the egg and add half at a time. * Do not open oven door at the first 10-15 minutes when the puff is rising. The sudden rush of air into the oven could cause the puff to deflate and not rise well. *Just be caution when you drizzle caramel, your feet is covered because sometimes you can get too excited and some caramel glaze will drip on your feet, it wouldn’t be the best feeling ever.!! *Spun sugar don’t last here in humid places unless you use isomalt. But knowing that my family don’t really like caramel-things, I didn’t dip all the puffs, I dipped mainly at the sides so they stick to the next puff. * If you have caramel stuck to your pot / pan and can’t remove it, just pour water and boil it. 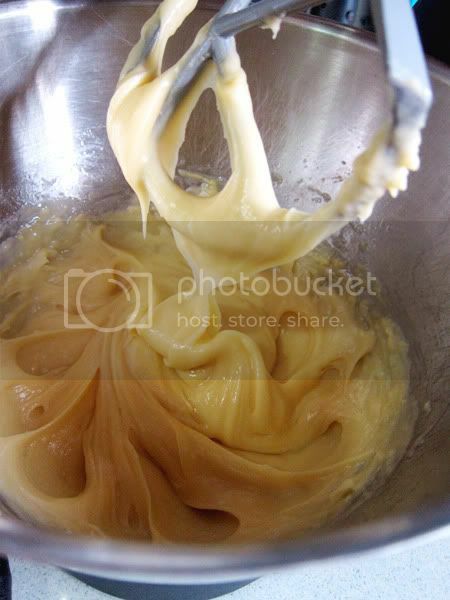 The caramel will dissolve and voila your pot is brand new again! Looking forward for next month’s challenge!